For other people named Ravi Shankar, see Ravi Shankar (disambiguation). Ravi Shankar (IPA: [ˈrɔbi ˈʃɔŋkɔr]; 7 April 1920 – 11 December 2012), born Robindro Shaunkor Chowdhury (Rabindra Shankar Chowdhury in Hindi), his name often preceded by the title Pandit (Master) and "Sitar maestro", was a Bengali Indian musician and a composer of Hindustani classical music. He was the best-known proponent of the sitar in the second half of the 20th century and influenced many other musicians throughout the world. Shankar was awarded India's highest civilian honour, the Bharat Ratna in 1999. Shankar was born to a Bengali Brahmin family in India, and spent his youth touring India and Europe with the dance group of his brother Uday Shankar. He gave up dancing in 1938 to study sitar playing under court musician Allauddin Khan. After finishing his studies in 1944, Shankar worked as a composer, creating the music for the Apu Trilogy by Satyajit Ray, and was music director of All India Radio, New Delhi, from 1949 to 1956. In 1956, Shankar began to tour Europe and the Americas playing Indian classical music and increased its popularity there in the 1960s through teaching, performance, and his association with violinist Yehudi Menuhin and Beatles guitarist George Harrison. His influence on the latter helped popularize the use of Indian instruments in pop music in the latter half of the 1960s. Shankar engaged Western music by writing compositions for sitar and orchestra, and toured the world in the 1970s and 1980s. From 1986 to 1992, he served as a nominated member of Rajya Sabha, the upper chamber of the Parliament of India. He continued to perform until the end of his life. Shankar was born on 7 April 1920 in Benares, then the capital of the eponymous princely state, in a Bengali family, as the youngest of seven brothers. His father, Shyam Shankar Chowdhury, was a Middle Temple barrister and scholar from East Bengal (now Bangladesh). A respected statesman, lawyer and politician, he served for several years as dewan (Prime minister) of Jhalawar, Rajasthan, and used the Sanskrit spelling of the family name and removed its last part. Shyam was married to Hemangini Devi who hailed from a small village named Nasrathpur in Mardah block of Ghazipur district, near Benares and his father was a prosperous landlord. Shyam later worked as a lawyer in London, England, and there he married a second time while Devi raised Shankar in Benares, and did not meet his son until he was eight years old. Shankar shortened the Sanskrit version of his first name, Ravindra, to Ravi, for "sun". Shankar had five siblings: Uday (who became a famous choreographer and dancer), Rajendra, Debendra and Bhupendra. Shankar attended the Bengalitola High School in Benares between 1927 and 1928. At the age of ten, after spending his first decade in Benares, Shankar went to Paris with the dance group of his brother, choreographer Uday Shankar. By the age of 13 he had become a member of the group, accompanied its members on tour and learned to dance and play various Indian instruments. Uday's dance group travelled Europe and the United States in the early to mid-1930s and Shankar learned French, discovered Western classical music, jazz, cinema and became acquainted with Western customs. Shankar heard Allauddin Khan – the lead musician at the court of the princely state of Maihar – play at a music conference in December 1934 in Calcutta, and Uday convinced the Maharaja of Maihar H.H Maharaja Brijnath singh Judev in 1935 to allow Khan to become his group's soloist for a tour of Europe. Shankar was sporadically trained by Khan on tour, and Khan offered Shankar training to become a serious musician under the condition that he abandon touring and come to Maihar. Shankar's parents had died by the time he returned from the Europe tour, and touring the West had become difficult because of political conflicts that would lead to World War II. Shankar gave up his dancing career in 1938 to go to Maihar and study Indian classical music as Khan's pupil, living with his family in the traditional gurukul system. 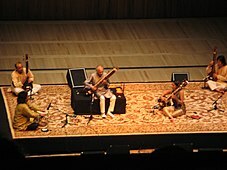 Khan was a rigorous teacher and Shankar had training on sitar and surbahar, learned ragas and the musical styles dhrupad, dhamar, and khyal, and was taught the techniques of the instruments rudra veena, rubab, and sursingar. He often studied with Khan's children Ali Akbar Khan and Annapurna Devi. 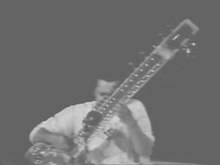 Shankar began to perform publicly on sitar in December 1939 and his debut performance was a jugalbandi (duet) with Ali Akbar Khan, who played the string instrument sarod. Shankar completed his training in 1944. He moved to Mumbai and joined the Indian People's Theatre Association, for whom he composed music for ballets in 1945 and 1946. Shankar recomposed the music for the popular song "Sare Jahan Se Achcha" at the age of 25. He began to record music for HMV India and worked as a music director for All India Radio (AIR), New Delhi, from February 1949 to January 1956. Shankar founded the Indian National Orchestra at AIR and composed for it; in his compositions he combined Western and classical Indian instrumentation. Beginning in the mid-1950s he composed the music for the Apu Trilogy by Satyajit Ray, which became internationally acclaimed. He was music director for several Hindi movies including Godaan and Anuradha. Shankar heard about the positive response Khan received and resigned from AIR in 1956 to tour the United Kingdom, Germany, and the United States. He played for smaller audiences and educated them about Indian music, incorporating ragas from the South Indian Carnatic music in his performances, and recorded his first LP album Three Ragas in London, released in 1956. In 1958, Shankar participated in the celebrations of the tenth anniversary of the United Nations and UNESCO music festival in Paris. From 1961, he toured Europe, the United States, and Australia, and became the first Indian to compose music for non-Indian films. [b] Shankar founded the Kinnara School of Music in Mumbai in 1962. Shankar befriended Richard Bock, founder of World Pacific Records, on his first American tour and recorded most of his albums in the 1950s and 1960s for Bock's label. The Byrds recorded at the same studio and heard Shankar's music, which led them to incorporate some of its elements in theirs, introducing the genre to their friend George Harrison of the Beatles. In 1967, Shankar performed a well-received set at the Monterey Pop Festival. While complimentary of the talents of several of the rock artists at the festival, he said he was "horrified" to see Jimi Hendrix set fire to his guitar on stage: "That was too much for me. In our culture, we have such respect for musical instruments, they are like part of God." Shankar's live album from Monterey peaked at number 43 on Billboard's pop LPs chart in the US, which remains the highest placing he achieved on that chart. Shankar won a Grammy Award for Best Chamber Music Performance for West Meets East, a collaboration with Yehudi Menuhin. He opened a Western branch of the Kinnara School of Music in Los Angeles, in May 1967, and published an autobiography, My Music, My Life, in 1968. In 1968, he composed the score for the film Charly. It makes me feel rather hurt when I see the association of drugs with our music. The music to us is religion. The quickest way to reach godliness is through music. I don't like the association of one bad thing with the music. In October 1970 Shankar became chair of the department of Indian music of the California Institute of the Arts after previously teaching at the City College of New York, the University of California, Los Angeles, and being guest lecturer at other colleges and universities, including the Ali Akbar College of Music. In late 1970, the London Symphony Orchestra invited Shankar to compose a concerto with sitar. Concerto for Sitar & Orchestra was performed with André Previn as conductor and Shankar playing the sitar. [c] Shankar performed at the Concert for Bangladesh in August 1971, held at Madison Square Garden in New York. After the musicians had tuned up on stage for over a minute, the crowd of rock-music fans broke into applause, to which the amused Shankar responded: "If you like our tuning so much, I hope you will enjoy the playing more." Although interest in Indian music had decreased in the early 1970s, the live album from the concert became one of the best-selling recordings to feature the genre and won Shankar a second Grammy Award. As for Shankar and the sitar, they are extensions one of the other, each seeming to enter into the other's soul in one of the world's supreme musical arts. It is a thing inimitable, beyond words and forever new. For, as Shankar explained, 90 percent of all the music played was improvised. He performed in Moscow in 1988, and had first been there to play in 1954. His 1988 concert was performed with 140 musicians, including the Russian Folk Ensemble and members of the Moscow Philharmonic, along with his own group of Indian musicians. He served as a member of the Rajya Sabha, the upper chamber of the Parliament of India, from 12 May 1986 to 11 May 1992, after being nominated by Indian Prime Minister Rajiv Gandhi. Shankar composed the dance drama Ghanashyam in 1989. His liberal views on musical co-operation led him to contemporary composer Philip Glass, with whom he released an album, Passages, in 1990, in a project initiated by Peter Baumann of the band Tangerine Dream. Because of the positive response to Shankar's 1996 career compilation In Celebration, Shankar wrote a second autobiography, Raga Mala. He performed in between 25 and 40 concerts every year during the late 1990s. Shankar taught his daughter Anoushka Shankar to play sitar and in 1997 became a Regents' Professor at University of California, San Diego. He performed with Anoushka for the BBC in 1997 at the Symphony Hall, Birmingham England. In the 2000s, he won a Grammy Award for Best World Music Album for Full Circle: Carnegie Hall 2000 and toured with Anoushka, who released a book about her father, Bapi: Love of My Life, in 2002. [f] After Harrison's death in 2001, Mr. Shankar performed at the Concert for George, a celebration of Harrison's music staged at the Royal Albert Hall in London in 2002. In June 2008, Shankar played what was billed as his last European concert, but his 2011 tour included dates in the United Kingdom. Harrison became interested in Indian classical music, bought a sitar and used it to record the song "Norwegian Wood (This Bird Has Flown)". In 1968 he went to India to take lessons from Shankar, some of which were captured on film. This led to Indian music being used by other musicians and created the raga rock trend. As the sitar and Indian music grew in popularity, groups such as The Rolling Stones, The Animals and The Byrds began using it in some of their songs. The influence even extended to blues musicians such as Michael Bloomfield, who created a raga-influenced improvisation number, "East-West" (Bloomfield scholars have cited its working title as "The Raga" when Bloomfield and his collaborator Nick Gravenites began to develop the idea) for the Butterfield Blues Band in 1966. I think Ravi was rather taken aback, because he was a classical musician, and rock and roll was really out of his sphere. He thought it rather amusing that George took to him so much, but he and George really bonded. Ravi realised that it wasn't just a fashion for George, that he had dedication. Ravi had such integrity, and was someone to be respected, and at the same time huge fun. George hadn't really met anyone like that, and he really encouraged his interest. Harrison met Shankar in London in June 1966 and visited India later that year for six weeks to study sitar under Shankar in Srinagar. During the visit, a documentary film about Shankar named Raga was shot by Howard Worth, and released in 1971. 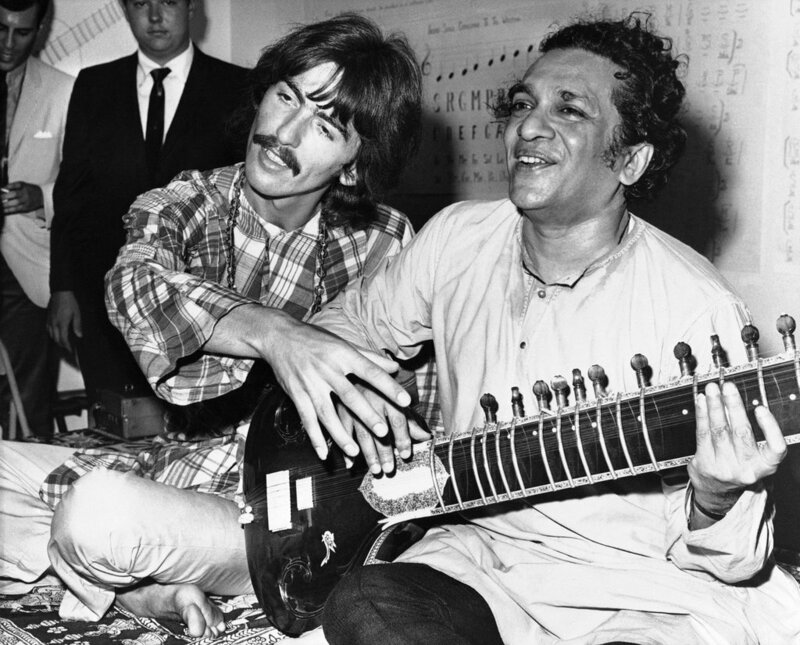 Shankar's association with Harrison greatly increased Shankar's popularity and Ken Hunt of AllMusic would state that Shankar had become "the most famous Indian musician on the planet" by 1966. George Harrison organized the charity Concert for Bangladesh in August 1971, in which Shankar participated. During the 1970s, Shankar and Harrison worked together again, recording Shankar Family & Friends in 1973 and touring North America the following year to a mixed response after Shankar had toured Europe with the Harrison-sponsored Music Festival from India. Shankar wrote a second autobiography, Raga Mala, with Harrison as editor. Shankar developed a style distinct from that of his contemporaries and incorporated influences from rhythm practices of Carnatic music. His performances begin with solo alap, jor, and jhala (introduction and performances with pulse and rapid pulse) influenced by the slow and serious dhrupad genre, followed by a section with tabla accompaniment featuring compositions associated with the prevalent khyal style. Shankar often closed his performances with a piece inspired by the light-classical thumri genre. 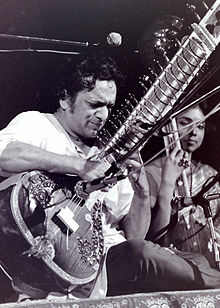 Shankar has been considered one of the top sitar players of the second half of the 20th century. He popularised performing on the bass octave of the sitar for the alap section and became known for a distinctive playing style in the middle and high registers that used quick and short deviations of the playing string and his sound creation through stops and strikes on the main playing string. Narayana Menon of The New Grove Dictionary noted Shankar's liking for rhythmic novelties, among them the use of unconventional rhythmic cycles. Hans Neuhoff of Musik in Geschichte und Gegenwart has argued that Shankar's playing style was not widely adopted and that he was surpassed by other sitar players in the performance of melodic passages. Shankar's interplay with Alla Rakha improved appreciation for tabla playing in Hindustani classical music. Shankar promoted the jugalbandi duet concert style and claims to have introduced new ragas Tilak Shyam, Nat Bhairav and Bairagi. Honorary degrees from universities in India and the United States. Silver Bear Extraordinary Prize of the Jury at the 1957 Berlin International Film Festival (for composing the music for the movie Kabuliwala). Posthumous nomination in the 56th Annual Grammy Awards for his album "The Living Room Sessions Part 2". American jazz saxophonist John Coltrane named his son Ravi Coltrane after Shankar. On 7 April 2016 (his 96th birthday), Google published a Google Doodle to honor his work. Google commented: "Shankar evangelized the use of Indian instruments in Western music, introducing the atmospheric hum of the sitar to audiences worldwide. Shankar's music popularized the fundamentals of Indian music, including raga, a melodic form and widely influenced popular music in the 1960s and 70s.". Shankar married Allauddin Khan's daughter Annapurna Devi (Roshanara Khan) in 1941 and their son, Shubhendra Shankar, was born in 1942. He separated from Devi during 1962 and continued a relationship with Kamala Shastri, a dancer, that had begun in the late 1940s. An affair with Sue Jones, a New York concert producer, led to the birth of Norah Jones in 1979. He separated from Shastri in 1981 and lived with Jones until 1986. An affair with Sukanya Rajan, whom he had known since the 1970s, led to the birth of their daughter Anoushka Shankar in 1981. In 1989 he married Sukanya Rajan at Chilkur Temple in Hyderabad. Shankar's son, Shubhendra "Shubho" Shankar, often accompanied him on tours. He could play the sitar and surbahar, but elected not to pursue a solo career. Shubhendra died of pneumonia in 1992. Ananda Shankar, the experimental fusion musician, is his nephew. Norah Jones became a successful musician in the 2000s, winning eight Grammy Awards in 2003. Anoushka Shankar was nominated for a Grammy Award for Best World Music Album in 2003. Anoushka and her father were both nominated for Best World Music Album at the 2013 Grammy Awards for separate albums. "Varanasi is the eternal abode of Lord Shiva, and one of my favorite temples is that of Lord Hanuman, the monkey god. The city is also where one of the miracles that have happened in my life took place: I met Ma Anandamayi, a great spiritual soul. Seeing the beauty of her face and mind, I became her ardent devotee. Sitting at home now in Encinitas, in Southern California, at the age of 88, surrounded by the beautiful greens, multi-colored flowers, blue sky, clean air, and the Pacific Ocean, I often reminisce about all the wonderful places I have seen in the world. I cherish the memories of Paris, New York, and a few other places. But Varanasi seems to be etched in my heart!" In his later years, Shankar became a vegetarian. He wore a large diamond ring which he said was "manifested" by Sathya Sai Baba. He lived with Sukanya in Encinitas, California. Shankar performed his final concert, with daughter Anoushka, on 4 November 2012 at the Terrace Theater in Long Beach, California. On 9 December 2012, Shankar was admitted to Scripps Memorial Hospital in La Jolla, San Diego, California after complaining of breathing difficulties. 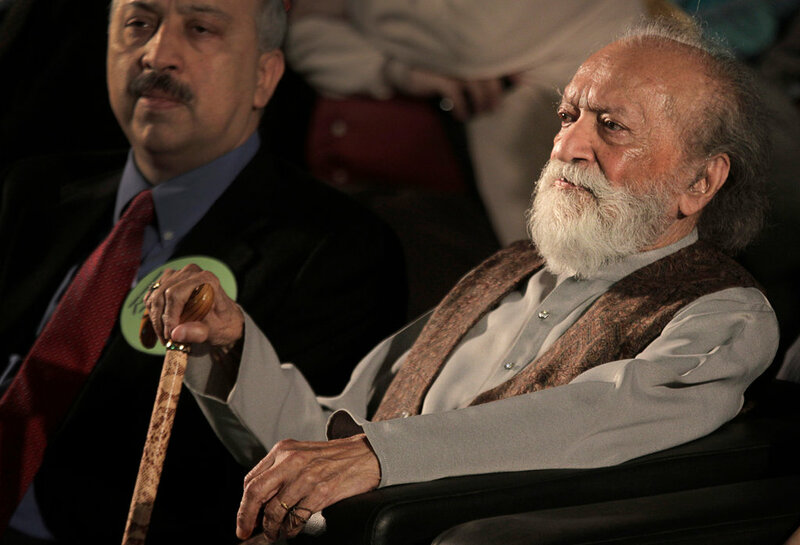 He died on 11 December 2012 at around 16:30 PST after undergoing heart valve replacement surgery. 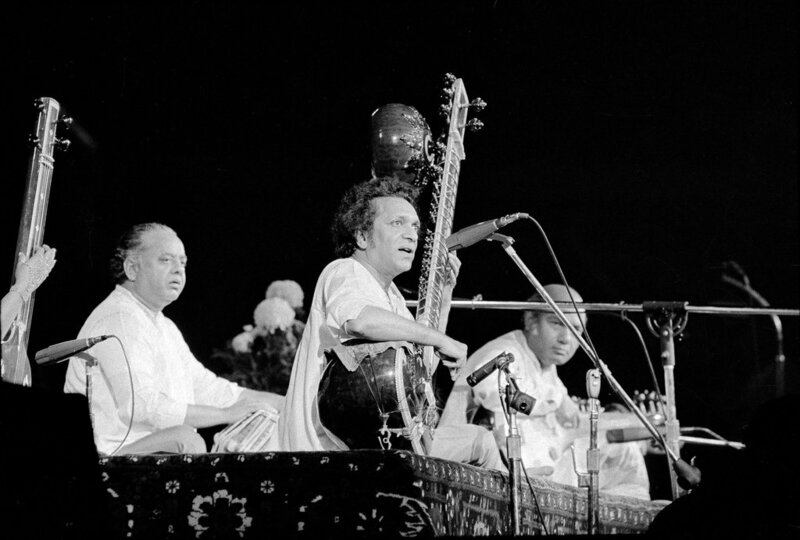 The Swara Samrat festival, organized on 5–6 January 2013 and dedicated to Ravi Shankar and Ali Akbar Khan, included performances by such musicians as Shivkumar Sharma, Birju Maharaj, Hariprasad Chaurasia, Zakir Hussain, and Girija Devi. ^ Shankar declined to attend because of problems in his marriage, but recommended Ali Akbar Khan to play instead. Khan reluctantly accepted and performed with tabla (percussion) player Chatur Lal in the Museum of Modern Art, and he later became the first Indian classical musician to perform on American television and record a full raga performance, for Angel Records. ^ Chatur Lal accompanied Shankar on tabla until 1962, when Alla Rakha assumed the role. ^ Hans Neuhoff of Musik in Geschichte und Gegenwart has criticized the usage of the orchestra in this concerto as "amateurish". ^ In his absence, Shankar's sister-in-law, singer Lakshmi Shankar, conducted the touring orchestra. ^ Anoushka performed a composition by Shankar for the 2002 Harrison memorial Concert for George and Shankar wrote a third concerto for sitar and orchestra for Anoushka and the Orpheus Chamber Orchestra. ^ This performance was recorded and is available on CD. The website of the Ravi Shankar Foundation provides the information that "The symphony was written in Indian notation in 2010, and has been interpreted by his student and conductor, David Murphy." The information available on the website does not explain this process of "interpretation" of Ravi Shankar's notation by David Murphy, nor how Ravi Shankar's Indian notation could accommodate Western orchestral writing. ^ "East Meets West Music & Ravi Shankar Foundation". East Meets West Music, Inc. Ravi Shankar Foundation. 2010. Retrieved 12 December 2012. ^ Lavezzoli, Peter (2006). The Dawn of Indian Music in the West. A&C Black. p. 48. ISBN 9780826418159. ^ The 100 Most Influential Musicians of All Time. Britannica Educational Publishing. p. 224. Retrieved 1 October 2009. ^ Vasudev Vasanthi (2008). Harmony 4. Pearson Education India. p. 121. ^ "Pandit Ravi Shankar". Cultural India. Retrieved 15 May 2015. ^ a b c d e f Hunt, Ken. "Ravi Shankar – Biography". AllMusic. Retrieved 15 July 2009. ^ "Shankar, Ravi (Biography)". Ramon Magsaysay Award Foundation. Archived from the original on 6 October 2015. Retrieved 6 October 2015. ^ a b c Deb, Arunabha (26 February 2009). "Ravi Shankar: 10 interesting facts". Mint. Retrieved 18 July 2009. ^ Schickel, Richard (12 February 2005). "The Apu Trilogy (1955, 1956, 1959)". Time. Retrieved 14 October 2010. ^ "A lesser known side of Ravi Shankar". Hindustan Times. 12 December 2012. Archived from the original on 14 December 2012. Retrieved 12 December 2012. ^ Ravi Shankar performing at the Monterey Pop (June 1967), 18 min. ^ video: "Jimi Hendrix Sets Guitar On Fire at Monterey Pop Festival, 1967"
^ Gallo, Phil (12 December 2012). "Ravi Shankar's Impact on Pop Music: An Appreciation". billboard.com. Retrieved 26 July 2017. ^ a b c d e Glass, Philip (9 December 2001). "George Harrison, World-Music Catalyst And Great-Souled Man; Open to the Influence of Unfamiliar Cultures". The New York Times. Retrieved 16 July 2009. ^ a b c d "Past Winners Search". National Academy of Recording Arts and Sciences. Retrieved 7 June 2011. ^ a b O'Mahony, John (8 June 2008). "Ravi Shankar bids Europe adieu". The Taipei Times. UK. Retrieved 18 July 2009. 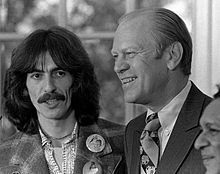 ^ "Ravi Shankar, who introduced The Beatles to the sitar and father of Norah Jones, dies aged 92 - Daily Mail Online". Mail Online. Retrieved 6 May 2015. ^ Rogers, Adam (8 August 1994). "Where Are They Now?". Newsweek. Retrieved 10 July 2009. ^ a b Piccoli, Sean (19 April 2005). "Ravi Shankar remains true to his Eastern musical ethos". South Florida Sun-Sentinel. Retrieved 18 July 2009. ^ "Ravi Shankar - Inside the Kremlin"
^ "'Rajya Sabha Members'/Biographical Sketches 1952 – 2003" (PDF). Rajya Sabha. 6 January 2004. Retrieved 29 July 2010. ^ "Shankar advances her music". The Washington Times. 16 November 1999. Retrieved 4 November 2009. ^ "Legendary Virtuoso Sitarist Rave Shankar Accepts Regents' Professor Appointment at University of California, San Diego". UCSDnews. 18 September 1997. ^ "Ravi Shankar & Anoushka Shankar Live: Raag Khamaj (1997)"
^ Idato, Michael (9 April 2004). "Concert for George". Sydney Morning Herald. Retrieved 18 July 2009. ^ "Anoushka enthralls at New York show". The Hindu. India. 4 February 2009. Retrieved 18 July 2009. ^ Barnett, Laura (6 June 2011). "Portrait of the artist: Ravi Shankar, musician". The Guardian. Retrieved 7 June 2011. ^ Photo of Ravi Shankar (3rd from left) and his wife Sukanya Shankar with former Beatle Sir Paul McCartney (2nd from left) and Ringo Starr (right). ^ "New album: Ravi Shankar Symphony – exclusive on iTunes - London Philharmonic Orchestra News". London Philharmonic Orchestra News. Retrieved 6 May 2015. ^ "Ravi Shankar". Retrieved 6 May 2015. ^ Kozinn, Allan (1 December 2001). "George Harrison, 'Quiet Beatle' And Lead Guitarist, Dies at 58". The New York Times. Retrieved 23 October 2010. ^ Thompson, Howard (24 November 1971). "Screen: Ravi Shankar; ' Raga,' a Documentary, at Carnegie Cinema". The New York Times. Retrieved 19 July 2009. ^ "Raga (2010 Remaster)". East Meets West Music. Retrieved 25 October 2016. ^ "SNA: List of Akademi Awardees – Instrumental – Sitar". Sangeet Natak Akademi. Archived from the original on 30 May 2015. Retrieved 29 July 2010. ^ "SNA: List of Akademi Fellows". Sangeet Natak Akademi. Archived from the original on 4 March 2016. Retrieved 29 July 2010. ^ "राष्ट्रीय कालिदास सम्मान" [Rashtriya Kalidas Samman] (in Hindi). Department of Public Relations of Madhya Pradesh. 2006. Archived from the original on 25 July 2010. Retrieved 29 July 2010. ^ "Padma Awards". Ministry of Communications and Information Technology. Retrieved 16 July 2009. ^ "Citation for Ravi Shankar". Ramon Magsaysay Award Foundation. Retrieved 18 July 2009. ^ Massey, Reginald (12 December 2012). "Ravi Shankar obituary: Indian virtuoso who took the sitar to the world". The Guardian. Retrieved 11 May 2014. ^ "Sir Ravi". Billboard. Nielsen Business Media, Inc. 113 (19): 14. 12 May 2001. ISSN 0006-2510. ^ "Citation for Doctor of Laws honoris causa – Mr Ravi Shankar" (PDF). Archived from the original (PDF) on 15 May 2013. Retrieved 13 December 2012. ^ "Archive > Annual Archives > 1957 > Prize Winners". Berlin International Film Festival. Retrieved 21 August 2010. ^ "Ravi Shankar – The 2nd Fukuoka Asian Culture Prizes 1991". Asian Month. 2009. Archived from the original on 7 July 2011. Retrieved 18 July 2009. ^ van Gelder, Lawrence (14 May 1998). "Footlights". The New York Times. Retrieved 18 July 2009. ^ PTI (6 December 2012). "Arts / Music : Ravi Shankar to be honoured with lifetime Grammy". The Hindu. Retrieved 13 December 2012. ^ "Pt Ravi Shankar gets posthumous Grammy nomination". India Today. 7 December 2013. Retrieved 7 December 2013. ^ PTI (6 March 2013). "Arts / Music : Ravi Shankar to be honoured with Tagore Award". Zee News. Retrieved 6 March 2013. ^ Watrous, Peter (16 June 1998). "Pop Review; Just Music, No Oedipal Problems". The New York Times. Retrieved 26 September 2010. ^ "Ravi Shankar's 96th Birthday". Google. 7 April 2016. Retrieved 9 April 2019. ^ a b c "Hard to say no to free love: Ravi Shankar". Press Trust of India. Rediff.com. 13 May 2003. Retrieved 18 July 2009. ^ "Balaji temple in Hyderabad was stage for Pandit Ravi Shankar's secret wedding". The Times of India. Retrieved 13 December 2012. ^ a b Lindgren, Kristina (21 September 1992). "Shubho Shankar Dies After Long Illness at 50". Los Angeles Times. Retrieved 31 August 2009. ^ a b Venugopal, Bijoy (24 February 2003). "Norah's night at the Grammys". Rediff.com. Retrieved 5 November 2009. ^ Jamkhandikar, Shilpa (6 December 2012). "It's Ravi Shankar versus daughter Anoushka at the Grammys". Reuters. Retrieved 12 December 2012. ^ Melwani, Lavina (24 December 1999). "In Her Father's Footsteps". Rediff.com. Retrieved 18 July 2009. ^ "Signing up for the veg revolution". Screen. 8 December 2000. Archived from the original on 9 April 2008. Retrieved 10 November 2009. ^ Schnabel, Tom (27 April 2011). "Ravi Shankar, Sai Baba, and the Huge Diamond Ring". KCRW. Retrieved 14 June 2016. ^ Varga, George (10 April 2011). "At 91, Ravi Shankar seeks new musical vistas". signonsandiego.com. Retrieved 25 April 2011. ^ "Classical legends leave their mark". The Times of India. Retrieved 9 January 2013. "Shankar, Ravi". Brockhaus Enzyklopädie (in German). 20 (19th ed.). Mannheim: F. A. Brockhaus GmbH. 1993. ISBN 3-7653-1120-0. Ghosh, Dibyendu (December 1983). "A Humble Homage to the Superb". In Ghosh, Dibyendu (ed.). The Great Shankars. Kolkata: Agee Prakashani. p. 7. OCLC 15483971. Ghosh, Dibyendu (December 1983). "Ravishankar". In Ghosh, Dibyendu (ed.). The Great Shankars. Kolkata: Agee Prakashani. p. 55. OCLC 15483971. Menon, Narayana (1995) . "Shankar, Ravi". In Sadie, Stanley (ed.). The New Grove Dictionary of Music and Musicians. 17 (1st ed.). London: Macmillan Publishers. ISBN 1-56159-174-2. Neuhoff, Hans (2006). "Shankar, Ravi". In Finscher, Ludwig (ed.). Die Musik in Geschichte und Gegenwart: allgemeine Enzyklopädie der Musik (in German). 15 (2nd ed.). Bärenreiter. ISBN 3-7618-1122-5. Slawek, Stephen (2001). "Shankar, Ravi". In Sadie, Stanley (ed.). The New Grove Dictionary of Music and Musicians. 23 (2nd ed.). London: Macmillan Publishers. ISBN 0-333-60800-3.